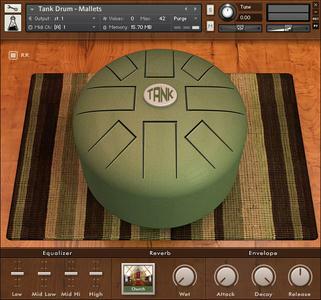 Tank Drum features samples from a famous steel tongue drum. Also called hank drums, these instruments are usually made out of propane tanks with tongues of different sizes and tuned in different scales. The instrument we have sampled features 8 tongues and it's tuned in E minor pentatonic. It was played both with hands and rubber mallets along with some sound effects with hands and brushes. The sound has a long release and is rich in harmonics.